The Orchidea apt. 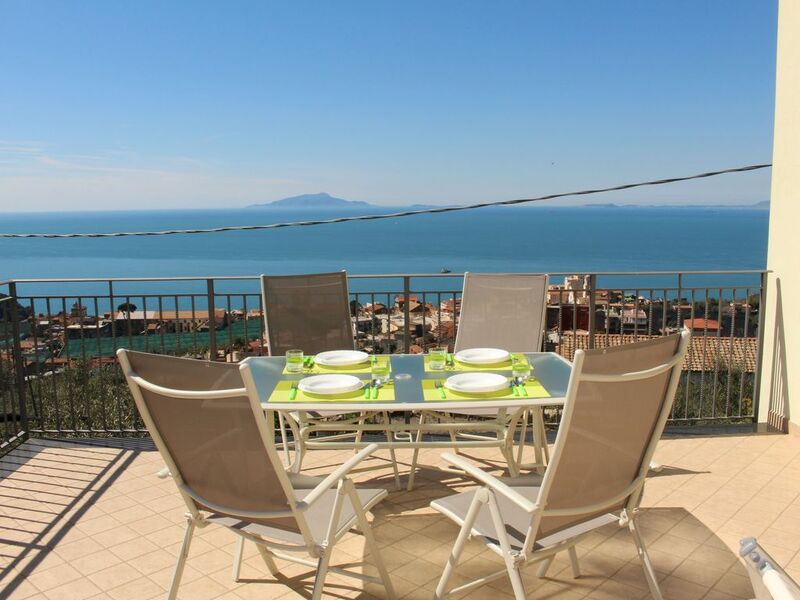 is situated on the first floor and is blessed with a 360° astonishing view of the Bay of Naples where you can enjoy views of the Isle of Capri, Ischia and Procida. The Orchidea apartment has a living room comprised of a kitchen with a panoramic terrace; 2 bedrooms of which one has a small panoramic and private terrace; there is also a private bathroom and laundry room. The building has recently been restructed in a modern way to ensure every comfort and well-being during your stay. The villa is surrounded by a marvellous Lemon and Olive grove that makes your holiday unique, waking up to the scents of nature. The apartment has every comfort to make your stay pleasant such as air conditioning, wi-fi, microwave, coffee machine, toaster, washing machine, B.B.Q, hairdryer, iron with ironboard. Guests have the use of the ample terrace with its breathtaking view of the Bay of Naples, Isles of Capri, Ischia and Procida and where you can relax, sunbathe and watch the beautiful sunset while enjoying a glass of wine. You can enjoy a meal on the terrace using the chairs and table provided. Also use of the external patio where you will have the occasion to relax or read a book. The Orchidea apartment is on the first floor (without a lift). The Massa Lubrense council charges a holiday tax of 2euro per person, per night which is to be paid in cash at the moment of check-in. Massa Lubrense boasts some of the best beaches, Michelin Star Restaurant and frequently wins awards for its clear, clean sea. Less than 5 minutes away there is a Sita bus stop which links Massa Lubrense to Sorrento, Nerano with several restaurants and stanning beaches, and Sant'Agata, a delightful little town where you can eat Italian ice-cream or enjoy a drink while people watching. Massa Lubrense center is a Km away where you can find several shops, supermarkets, restaurants, pharmacy, bar. Hi, we at Eversun are based in Massa Lubrense which is a beautiful, scenic place on the Sorrento coast. We would be happy to show you around our fantastic Lemon Orchard with one of the most breathtaking views on the Bay of Naples. We are a family business and the needs of our clients are our priority. Our stay at Eversun Was absolutely wonderful in every way. Loved the hosts, the home, the location, the view, and the easy accessibility. Of all the places we have stayed on this 21 day holiday the Eversun experience was supreme. Thanks. Brian & Sue. Brian and his wife are really exquisite people, nice, kind, unique. They left the house very clean and tidy. They are really great guests, definitely recommended! I hope they can come back soon, because they will always be welcome at Eversun! Propriété neuve et très propre avec des propriétaires qui nous traitent aux petits soins. Propriété vraiment magnifique et toute neuve. Elle est d’une propreté exceptionnelle. La vue est vraiment sublime et notre hotessse a été d’une extrême gentillesse. L’endroit est très calme et tranquille et il y a un excellent restaurant tout près. Le bus passe tout près, il y a une petite marche de 6-7 minutes à faire.